Despite its failings...a hugely influential movie with literally towering design, mordant wit, and a hall-of-fame performance by Jack Nicholson. 126 min. Warner Brothers. Director: Tim Burton. Cast: Michael Keaton, Michael Gough, Jack Nicholson, Kim Basinger. In 1989, director Tim Burton was still a fresh commodity. Having proven himself the match for kitsch comic Paul Reubens with the cult classic Pee Wee's Big Adventure and capitalized on his horror-weenie image with Beetlejuice, Burton was primed for a mega-budget Hollywood actioner, and he got it. Typically, Burton orchestrates dazzling visuals and ham-handles plot. His lack of narrative instinct frustrates, but his genius is conceptual: Burton brims with ideas, expressed mostly in image. 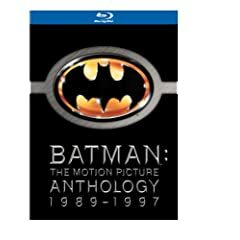 In Batman, then, Burton crafted a unique movie with its own unique set of problems. Despite its failings, Batman is a hugely influential movie with literally towering design, mordant wit, and a hall-of-fame performance by Jack Nicholson. Ay, there's the rub, of—as Nicholson's villainous Joker would say— another man's rhubarb. The movie's called Batman, but top-billed Nicholson is invited to crowd out Michael Keaton's caped crusader. If Batman and the Joker are ideal antagonists—both two-faced and vengeful, both borderline personalities—Nicholson and Keaton are ideally cast in the roles: both intense and eccentric, both arching gravity-defying eyebrows. The Batman character (conceived by Bob Kane and quickly refined by Bill Finger) debuted in DC's Detective Comics in 1940, and has appeared continuously since, starring in dozens of monthly titles over the years. Kane was partly influenced by the film The Bat Whispers and the adventures of Zorro. All the same, the 1940s Columbia Batman serials didn't stick, but perhaps they contributed to the softening of the characters over the years. Most point to the campy, candy-colored '60s television series as an attack on the character's dark roots, but Kane's pitch-black conception saw a gradual drift into kid-friendly enterprise: the introduction of Robin the Boy Wonder encouraged a lightening of tone that became definitive in the fifties. Batman comics were reclaimed as a dark art in the seventies, and have remained so since, most notably in Frank Miller's graphic novel The Dark Knight Returns. Burton's conception, then, was both fan-friendly and a buzz-worthy novelty to those who only recalled TV star Adam West's mock seriousness. The film's first scene reintroduces Batman in a proper context. A post-industrial Gotham City (boasting a shadowy Fritz Lang-inspired cityscape raised at London's Pinewood Studios by late production designer Anton Furst) seems to crowd in on its hapless citizens. Two street toughs rob a father, mother, and son emerging from a theater, then parcel out ther loot and debate rumors of "The Bat." In an illustration of the comics' idea that the bat would "strike terror into [the] hearts of" criminals, a black-cloaked, body-armored Batman appears mysteriously and takes out the trash, thoughtfully adding, "I'm Batman." The scene mirrors Batman's own origin in the mugging deaths of young Bruce Wayne's parents; in flashback, the screenwriters impose a bogus twist on this origin story. Quickly, Sam Hamm's story (with a script credited to Hamm and Warren Skaaren) turns to establishing Gotham's politics of crime: Police Commissioner Gordon (veteran Pat Hingle), District Attorney Harvey Dent (Billy Dee Williams), a Koch-like mayor, and a crime syndicate headed up by new character Carl Grissom (a delicious, scenery-chewing Jack Palance). Grissom's "number-one guy" is a hood named Jack Napier (Nicholson); since Napier is making time with Grissom's moll Alicia (Jerry Hall), Grissom sends him on a suicide mission to clean out evidence at the Axis Chemicals plant. In a subtly ambiguous moment, Batman fails to save Napier from plummeting into a vat of roiling acid. In a terrific underworld surgery scene that wouldn't look out of place in a German Expressionist horror silent, Burton shows restraint before a dramatic reveal. Now a permanently clown-faced ghoul, Napier goes all the way around the bend, rechristening himself the Joker and claiming Gotham's criminal spoils for himself. Nicholson tears into the role with gleeful abandon. Whether conversing with a corpse or trashing the "Flugelheim" Museum, Nicholson's Joker climbs and plumbs bipolar peaks and valleys: seducing, doing tricks, cackling, and generally quipping his way through the story. This Joker also carries a sexual charge: he pulls a long-muzzled pistol from his pants and Prince—the "Purple One"—is his musical representative (contributing six original songs to the soundtrack). The actor's technical brilliance is striking; it's a truly great old-school performance (for the record, the character of the Joker was originally modeled after Conrad Veidt in the 1928 silent The Man Who Laughs). Another character from the comics plays a role: Vicki Vale, a photojournalist love interest for Bruce Wayne. Kim Basinger's Vale is a Lois Lane surrogate, though Burton emphasizes that Vale's interest in the Batman is at least as sexual as it is professional. Otherwise, Vale is a blank damsel in distress, with a Jimmy Olsen-esque beat-reporter sidekick named Alexander Knox (a well-cast Robert Wuhl) dispensing '40s-styled comic relief. Besides being Joker fodder, Vale serves to challenge millionaire Bruce Wayne's near-exclusive commitment to his secret identity. When the two sit across a long dining-room table in stately Wayne Manor, Wayne admits this lifestyle doesn't suit him, but has commitment issues when it comes to revealing his true soul to Vale. This double-life constant of superhero angst makes a cutting metaphor for male stoicism. Otherwise, Hamm and Skaaren give relatively short shrift to Batman/Wayne. The Darknight Detective doesn't do all that much detecting, though he does do a bit of requisite super-computer research in the cavernous Batcave. Burton focuses—skillfully, it must be said—on two other Batman staples: gadgetry and fights. Batman's martial artistry is implicit in his fighting stances and Wayne Manor gallery of warriors of different cultures (an opportunity for more idiosyncratic Burton design), though no mention is made of his training, the subject of Christopher Nolan's Batman Begins. The Batmobile, Batplane, Batarang, and well-stocked utility belt all figure in the story, and Keaton has a nice rapport with Michael Gough, who plays Batman/Wayne's trusty butler Alfred. One of Batman's biggest strengths is its balance of baroque fearfulness with demented dark humor. The Joker hosts an infomercial dressed with his dead victims, and later tosses out money at Gotham's 200th Anniversary parade in a parody of political philanthropy set to Prince's "Trust." Burton and Elfman also make crazed use of Stephen Foster's "Beautiful Dreamer" as a theme for the Joker, who calls himself "the world's first fully-functioning homicidal artist." Nicholson gets all the best lines, of course ("Do I look like I'm joking? "), but Keaton's light stammering, as he attempts to confess his identity to Vale, is priceless. Burton finally buts Bats in the belfry, Gotham Cathedral, for a finale that nods to Vertigo. Burton applies photographic effects (overseen by Derek Meddings), miniatures, even animation to tell his grim fairy tale trimmed with comic-book color. Burton's stylish look here (and in 1992's Batman Returns) conjures the timeless take of Terry Gilliam's Brazil, which also melded contemporary trappings and explosive, vertiginous action to a mish-mash of thirties and forties designs; Burton even hired Brazil's crack cinematographer, Roger Pratt. Bob Ringwood's costumes imagine that hats never went out, and his Batsuit erases West's unflattering tights, instead providing Keaton imposing height and rubbery abs. Excepting Nicholson, Burton's most valuable player may be longtime collaborator Danny Elfman, whose creeping theme erupts into a percussive march in the opening credits. In that opening credit sequence, the camera travels through a stony Bat-logo. At the time, the exaltation of the symbol was over-the-top, faintly ridiculous, meaningless. In hindsight, it seems like a knowing postmodern joke about blockbuster cinema: Batman forever upped the ante, as much with its unprecedented marketing blitz as with the film itself. This Bat signal—like the one that triumphantly caps the film—urgently called the audience to "action," or from their theatre seats, at least to cheer for a moneyed crowd pleaser. From a strictly objective narrative standpoint, Batman says little more than that urban life is nasty, brutish, and demands a hero's sacrifice. But there's a special place at the movies for blockbuster cinema, with its genre cliffhangers and special effects. The trick is to nurture the stories with craft and striking, if not always deep, characters. Burton's effort stumbles a bit, but essentially delivers the goods. I've seen Tim Burton's Batman presented in nearly every possible way one might see it in the last twenty years: in its original theatrical exhibition, on television, and in its variant VHS and DVD editions (I skipped only the laserdisc iteration). 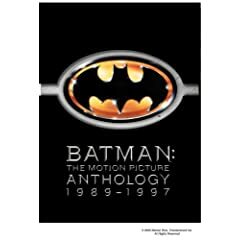 Perhaps it goes without saying, but the film's Blu-ray debut—as part of Batman: The Motion Picture Anthology 1989-1997—is head and shoulders above the rest. To my eye, contrast leans to a bit too bright, which sends some of the blacks into gray range in a misguided attempt to offer some details that are meant to be cloaked in shadow, and the film's special effects unavoidably add some layers of grit to the image; it wouldn't be the 1989 Batman without them. Still, color and detail are excellent, grain is healthy and film-like, and video noise is not apparent. Bonus features are retained from the DVD Anthology. The commentary by director Tim Burton starts off like gangbusters but eventually slows a bit; still, this is an invaluable resource for the film's rabid fan base. "On the Set with Bob Kane" (2:33, SD) follows Batman's proud papa Kane around Pinewood Studios, circa 1989. Narrated by Mark Hamill, "Legends of the Dark Knight: The History of Batman" (40:39, SD) is a fantastic overview of Batman in the comic books, in movie theaters and on television. Interviewees include writer Harlan Ellison, writer/historian Mark Cotta Vaz, writer/producer Michael E. Uslan, writer/artist Mike Mignola, Stan "The Man" Lee, writer/director Kevin Smith, writer/artist Frank Miller, writer Geoff Johns, writer/historian Les Daniels, Bob Kane's wife Elizabeth Sanders Kane, editor/writer Denny O'Neil, DC VP Editorial Dan DiDio, writer/producer Paul Dini, writer/producer Jeph Loeb, artist Alex Ross, DC president/publisher Paul Levitz, artist Brian Bolland, former DC president/editor Jenette Kahn, producer Eric Radomski, producer Bruce Timm. The bonus features center around the first three parts of the massive documentary Shadows of the Bat: The Cinematic Saga of the Dark Knight: "The Road to Gotham" (17:45, SD), "The Gathering Storm" (22:59), and "The Legend Reborn" (30:59). Part one covers development and concept; part two focuses on script and casting, and part three (with the bulk of the behind-the-scenes footage) deals with design, production, and the film's phenomenal success. Participants include producer Peter Guber, Uslan, producer Mark Canton, Lee, executive producer Benjamin Melniker, Superman: The Movie story consultant Tom Mankiewicz, Kane (vintage clips), Dini, Miller, screenwriter Sam Hamm, Elizabeth Sanders Kane, director Tim Burton, Kahn, Guber-Peters VP of Production Michael Besman, casting director Marion Dougherty, Michael Keaton, Billy Dee Williams, Kim Basinger, Jack Nicholson, Robert Wuhl, co-producer Chris Kenny, Sean Young, Michael Gough, Pat Hingle, 2nd unit director Peter Macdonald, director of photography Roger Pratt, composer Danny Elfman, Tracey Walter, and Smith. Beyond Batman comprises six production featurettes, amounting to a thorough look at the physical production and post-production scoring: "Visualizing Gotham: The Production Design of Batman" (10:25, SD), "Building the Batmobile" (9:24, SD), "Those Wonderful Toys: The Props and Gadgets of Batman" (6:02, SD), "Designing the Batsuit" (6:57, SD), "From Jack to the Joker" (10:39, SD), and "Nocturnal Overtures: The Music of Batman" (7:05, SD). Each title tells the tale of the featurette's content; among those interviewed are Guber, set decorator Peter Young, art director Terry Ackland-Snow, Pratt, supervising art director Les Tomkins, art director Nigel Phelps, Burton, Kenny, Williams, assistant costume designer Graham Churchyard, Basinger, Hamm, special effects supervisor John Evans, Macdonald, costume effects supervisor Vin Burnham, Batsuit wrangler Day Murch, Nicholson, Mankiewicz, "Joker" make-up designer Nick Dudman, Walter, Elfman, and orchestrator Steve Bartek. Batman: The Heroes (12:35 with "Play All" option, SD) profiles Batman, Vicki Vale, Alexander Knox, Commissioner Gordon, and Harvey Dent, with O'Neil, DiDio, Miller, Bolland, Ross, Uslan, Hamm, Burton (vintage and contemporary), Smith, Basinger (vintage and contemporary), Mignola, Wuhl, Nicholson, Dini, Hingle, and Williams. Batman: The Villains (7:21 with "Play All" option, SD) profiles The Joker and Bob the Goon, with Uslan, DiDio, Ross, Burton (vintage), Dougherty, Nicholson, and Walter. "Batman: The Complete Robin Storyboard Sequence" (4:24, SD) presents a designed but deleted sequence in a semi-animated storyboard form. The result features the voices of Kevin Conroy as Batman and Mark Hamill as the Joker (reprising their roles from Batman: The Animated Series). Last up are the "Theatrical Trailer" (1:49, SD) and three Prince music videos: "Batdance" (6:57, SD), "Partyman" (4:01, SD) and "Scandalous" (4:17, SD). Boy, are these blasts from the MTV past. A second disc houses a Digital Copy of the film for portable playback. Bat-fans, rejoice. Though it would be nice to see the bonus features in HD, it'll be a long time (if ever) before we see a better presentation than this highly satisfying Blu-ray edition. All site content © 2000-2019 Peter Canavese. Page generated at 04/24/2019 05:23:35PM.